Next Tuesday (February 2) the Regional Greenhouse Gas Initiative (RGGI) participating states and regional stakeholders will meet to begin their second in-depth review of the RGGI program. This meeting will solicit stakeholder input on RGGI program design elements, including considerations for compliance under EPA’s Clean Power Plan. The last program review in 2012 led to a 45 percent reduction in the regional CO2 cap, among other changes. This time around, there is an opportunity to do even more: put RGGI states on track to meet their long-term climate goals while at the same time saving ratepayers money and boosting local economies. Last week, a team of Synapse staff members led by Dr. Elizabeth A. Stanton released a report detailing least-cost strategies for RGGI states to reduce emissions 40 percent below 1990 levels by 2030. While this would require a 75 percent reduction from what the current program is expected to achieve by 2020, it would put each state on track for meeting its necessarily ambitious long-term greenhouse gas goals. Their analysis focused on four well-researched, cost-effective emission reduction measures: energy efficiency, wind and solar generation in the electric sector, and conversion from gas-powered to electric light-duty vehicles in the transportation sector. The strategies modeled to achieve an all-sector 40 percent emission reduction in the RGGI region by 2030 include: converting one-third of gasoline-powered light-duty vehicles to electric vehicles, achieving the Massachusetts level of energy efficiency savings in all nine states, investing in new wind generation up to its economic potential, and investing in smaller additions of new solar generation. 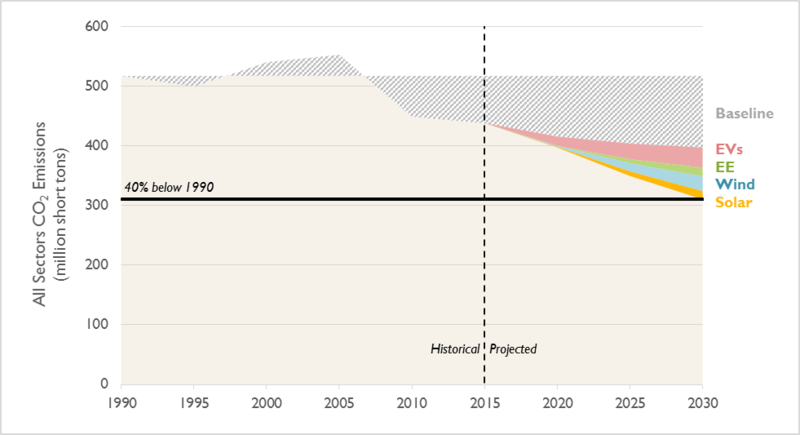 The figure shown here summarizes how each of these strategies helps reduce emissions to reach the target. The Synapse team found that achieving a 40 percent reduction using these strategies would likely yield $5.2 billion in total savings from 2016 through 2030 and 50,000 new jobs each year in the RGGI region compared to the current strategy. These savings come from lower electric bills for consumers, switching from gasoline- to electric-powered vehicles, and recycling RGGI auction revenues to lower the cost of other clean energy programs. This report shows that asking more from RGGI than its current targets is a win-win for consumers, workers, and the environment. As the RGGI participating states and regional stakeholders come together next week to review the RGGI program, Synapse’s new report serves as a reminder that the RGGI states can achieve their ambitious 2030 goals to drastically reduce greenhouse gases with considerable benefit to the region.